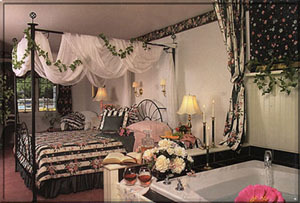 A classic Poconos Pennsylvania Country Inn that has aquired a reputation for excellence in accommodations, food and service. It is unusual that a small intimate inn manages to excel in all three. The Lodge consists of Bed and Breakfast Style accommodations in the Main Lodge, Cottage Style rooms in the cottages in the gardens area. Many of these are jacuzzi suites and some have complete kitchens and are appropriate for longer visits to the mountains. There are walking trials throughout the property and Crescent Lodge is sited in the geographic center of the Poconos with many activities within 15 minutes. 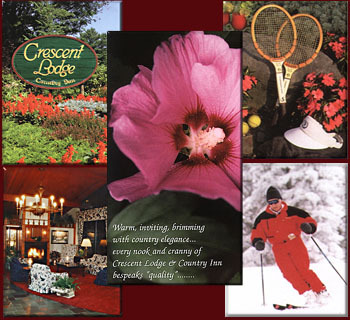 The Crescent Lodge and Country Inn is located in the heart of the Pocono Mountains near major Interstate roads is within a two hour drive from either New York City or Philadelphia. All of the rooms have thick fluffy comforters with matching fabrics, wall to wall carpeting, remote control television and private baths. Some of the rooms and suites have private sundecks, fireplaces, fully equipped kitchens and sunken jacuzzis. 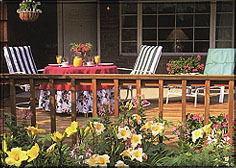 The location in the center of the Poconos means that this inn ins near many of the Poconos best attractions. Like Buck Hill Falls (Little know but beautiful), Callies Candy Kitchen, and there is easy access to horseback riding, hiking, boating, fishing, golf, skiing, snowmobiling, antiquing, and outlet shopping. The Restaurant at the Cresent lodge brings back many delightful memories to some on our staff, who have found romance while enjoying fine food. 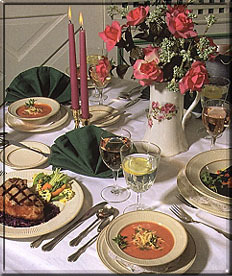 It is one of the finest in the area and offers a nice variety of entrees. The wine list has a large selection of fine wines and there is live piano music every Sunday. 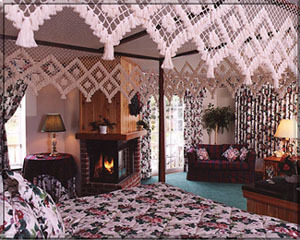 Each room in the inn has its own distinctive style and feeling. 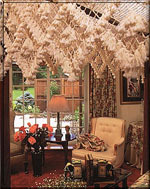 Snug canopy beds can be found in many rooms with matching wall, comforter, and drapery designs. Many of our cottages feature a fireplace, sunken jacuzzi for two and private outdoor patios and decks overlooking our flower-filled grounds.